MEET FIREFLYNever worry about your audio system's Bluetooth status again. 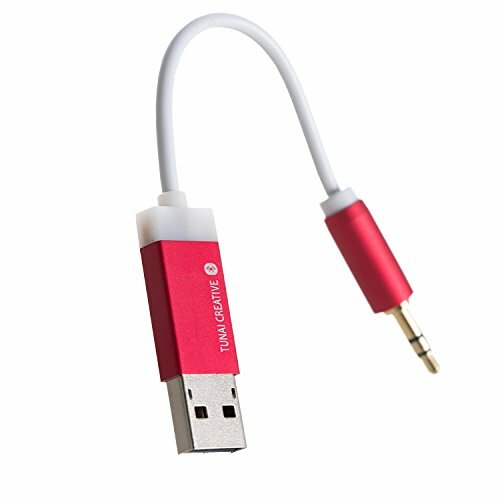 This nifty little Bluetooth receiver can upgrade your home or car audio system to wireless so you can easily connect and stream music from your smartphone or tablet.Perfection without compromiseAt just 10g (0.35oz), Firefly is the world's tiniest receiver that also provides high quality music streaming. It uses advanced audio compression technology that guarantees a smooth, authentic sound; using AAC/MP3 decompression support and patent pending "Sound Revitalization Technology" (SRT). Firefly also has aluminum anodized casing, pure copper cable and gold-plated connectors.Works out of the box!With a buttonless design, connection is quick and simple. Just plug Firefly to your audio system, switch on Bluetooth on your device, and pair. Once paired, Firefly will remember you and auto-connect whenever you're close by. The LED light on the USB end will glow like a firefly to indicate connection status. For extra convenience, Firefly can remember up to 8 paired devices and the party mode even allows two simultaneous connections, for easy switching between devices.Specs Bluetooth version: 4.0 (backward compatible) Supported Bluetooth profiles: All devices with compatible Bluetooth A2DP v1.2, SPP Supported formats: AAC, MP3 and SBC decoder Distance: Max. 10m / 33ft (without interference)What's In the Box[Car Pack] Firefly Bluetooth receiver, 3.5mm AUX extension cord (60cm / 23.6")[Home Pack] Firefly Bluetooth receiver, AUX to AV/RCA convert cable (1m / 39.4")[Premium Pack] Firefly Bluetooth receiver, 3.5mm AUX extension cord (60cm / 23.6"), AUX to AV/RCA convert cable (1m / 39.4")NOTE: In addition to the provided manual, for troubleshooting, check out the "tunai-creative" FAQ page. If you have any questions about this product by TUNAI, contact us by completing and submitting the form below. If you are looking for a specif part number, please include it with your message.